As a brand marketer, one of the biggest challenges when communicating with your target audience is doing so in an authentic way. Yet it is critical to do just that if you want your brand to be believable and gain trust and buy-in from your audience. What exactly is a Brand Voice? Brand voice is the unique personality of your brand in all written or spoken communication. It encompasses the tone, attitude, choice of words, grammar, colloquialisms, and even the type of punctuation you use to promote uniformity in your content across all channels. How well you define your brand voice will affect how successfully you communicate with your target audiences. And one of the best ways to define your brand voice is by creating target or buyer personas. Before we dive into this, it’s important to note the distinction between a customer profile and a customer persona. They are indeed two very different animals. A key difference between the two is that a persona is qualitative in nature, whereas a profile is quantitative. Personas are fictional characters that we make up based on data we collect to represent different types of customers, described in vivid detail. A persona can include anything from a person’s hobbies, food preferences, habits, motives, and desires to where they shop, what they read, what kind of car they drive, where they go for fun, and so on. To really do an effective job building a persona, we recommend that you speak to the actual customers themselves either through one-on-one interviews or focus groups. As mentioned, profiles are quantitative in nature and focus on actual data collected on the target audiences. Profiles focus more on “what” a customer does versus why they do it and include demographics such as age, income, education, location, actual purchases made, etc. This can be collected in a variety of ways and from a variety of sources including industry reports, government agencies, reference catalogs, US Census Bureau, business organizations, surveys, Google Analytics, etc. Just like having consistency for the visual elements of your brand, the way your brand sounds also must remain consistent to breed credibility and loyalty from your target audience. The larger your business or organization, the more important this is because you will have multiple people writing copy for your brand promotions or creating social media posts. Having a road map which we call a “content style manual” that spells it all out for the various people who are responsible for creating this content will ensure that you maintain a consistent voice across all channels. Ask any author how they write engaging copy or narratives and they will most assuredly tell you it’s by visualizing an actual person they are writing about or to, or creating in vivid detail in their mind a character that they can empathize with. Writing to a general individual or audience can be challenging since you’re not engaged with that person or people on an emotional level. Try it for yourself. Write a short letter or paragraph to a person who you don’t know—someone you stood behind in line at a coffee shop or the sales clerk at the market. What do you talk about? What do you ask them or tell them about your day? What tone do you use? Now imagine someone who you know intimately and write them a letter. Much easier, right? When you have a vivid picture in mind of who you’re writing to, it just comes more naturally and you have much more you can relate to and connect on. Now that you understand the importance of a consistent brand voice and the difference between personas and profiles, the next step is creating your personas. 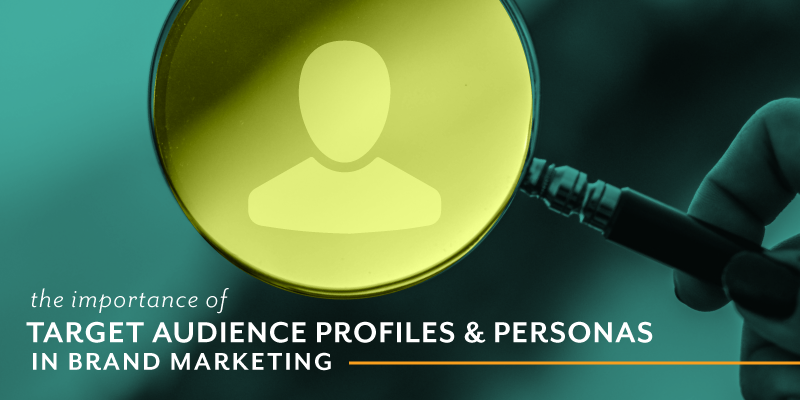 You will want to begin with the profile data that you’ve collected on your target audience. What gender, age, and ethnicity are they? What is their career and annual income? Did they attend college, graduate school, doctorate studies? In what city/state do they live and do they own a home or rent? Do you belong to any professional or networking organizations, and if so, which ones? Which social media channels do you spend the most time on? How much time on each? Do you volunteer? If so, for which organizations? What are the biggest challenges you’re currently facing in your personal life/job/career? You can find several articles with sample questions to ask in creating your buyer personas; this one is a good place to start. If you are unable to conduct an interview with someone in your target audience, you’ll have to make this up using the information you collected from your profile as your data for these characters. Research is your friend here, and a variety of information can be gleaned from searching sources online. Then, simply use the interview questions you pulled from the article above (or any of dozens of others available online) and answer each with your character in mind. The more you can visualize and “become” that character while you’re answering these questions, the better your persona will be. Then create the narrative for your Persona. Weave in all the answers to your interview questions to create a detailed description of this person. I’ve included an example here that we’ve used for one of our allies, so you can see how to organize this information in your narrative. Include a picture of your character. This will further help you visualize this person as you write your persona narrative. You can use any stock photo service or simply do a google search for an image with some of the demographics on your character. I’m a newlywed finally getting settled into my professional career as a Speech Language Pathologist. PAIN POINTS: As a newlywed and new homeowner, I’m on a bit of a tight budget, but still love to experience all the city has to offer and have fun! My husband and I want to enjoy the awesome farm-to-table restaurants and breweries in GR a couple times a week without breaking the bank—with a little wiggle room for someplace extra special maybe once or twice a month. HOW WE HELP: Client serves farm-fresh, earth-to-table meals for those who really value where their food comes from, how it’s prepared, and supporting the local community. We offer an intimate dining experience that won’t break the bank for a young professional couple. My husband and I were high school sweethearts and just recently married after 10 years dating! We purchased our ﬁrst home in Eastown just before the housing prices skyrocketed and we absolutely love the neighborhood. We plan on starting a family in 5 years, then moving to East Grand Rapids. I’ve been out of undergrad for a few years now, just recently completed grad school, and very proud to now be working in my field as a Speech Language Pathologist. My husband Nick is in the process of earning his CPA. Being newlyweds, homeowners, and puppy parents, we have a lot to adjust to, but we don’t want to miss out on anything our friends have planned, like spending a night downtown, hitting up the nightclubs, or making time for a romantic date night. Money may be a little tight, but you only live once, right? Since we’re busy at work and we love the experience of eating out, we tend to dine out a few times a week, but we really like to go all-out once a month (twice if we’re really feeling feisty) to a really nice place in the city. We prefer dining close by, so we can walk to and from dinner—or Uber if necessary. We’re constantly trying new places based on what our friends really like or what receives the best reviews on Facebook and Yelp, but when we ﬁnd something we like, we’ll be sure to go back. Even on fancier date nights when we’re willing to spend a bit more, we’re still looking for an awesome experience—delicious, Instagram-worthy food, made from local ingredients, with great price value. We’ll deﬁnitely order a couple drinks each while we’re out—usually any combo of a craft beer and craft cocktail. Since we don’t go on too many vacations, dining out is where we like to spend the big bucks. If we receive great service, we will leave a 20% tip, but anything more really isn’t in the budget right now. If we really like what we see and what we’re tasting, we’ll take lots of pics of our food before digging in and be sure to post them on Facebook and Instagram. We always tag the restaurant too because we love getting the credit and spreading the word to others about our awesome experience. If we’re not really feeling the experience, we probably won’t say anything to the staff face-to-face, but we will leave a review online with our comments. That way, both the business and other current and potential customers can learn about what happened. Interested in creating Target Personas for your brand? We can help! Creating target audience profiles and personas is truly one of our favorite things to do for our allies at The Image Shoppe, simply because it is so insightful and helpful for all brands. If you're interested in learning more about how we can help collect and create this information for you, and more benefits it would pose for your business, give us a shout!